Max Dresden uses Feedbackstr for customer service feedback. The owners of both very successful Max restaurants, one in Dresden’s ‘Neustadt’ neighborhood and the other in Dresden’s ‘Altstadt’ (old town), were some of Feedbackstr’s very first customers. Max not only serves as a critically acclaimed restaurant, but also as a cozy café and trendy bar, making the restaurant appealing to a large target group by having something for everyone. Max Dresden is known for its eclectic menu options, its inviting interior, and its excellent customer service, attracting first-time visitors & tourists with their positive online reviews and keeping Dresden residents and businesses coming back for more. The owners of the popular restaurant required Feedbackstr’s services to enable the continuous measurement of their service quality and customer satisfaction. By giving guests the unique possibility to directly contact and voice their opinions to both the owner & manager, the restaurant particularly hoped to obtain actionable customer suggestions, priorities, & wishes, enabling them to strengthen their bond to customers and increase overall satisfaction. 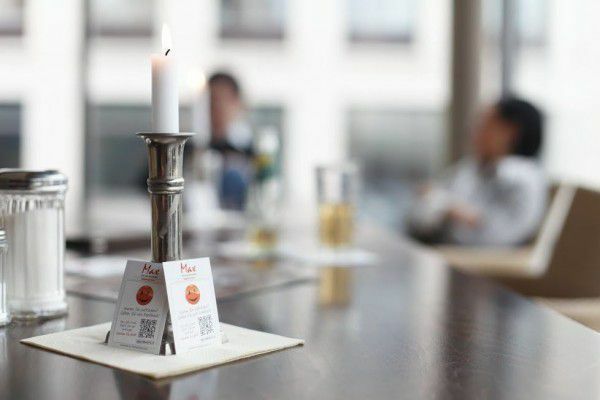 Feedbackstr developed a unique feedback strategy for Dresden’s beloved Max restaurant. The first step included the creation of custom-made satisfaction surveys which take all of Max’s requirements into account. The survey was made available to customers via small business cards (pictured above) which can be found on every table and a large QR code printed on the company’s weekly lunch menu. This strategy enables Max guests to either submit their feedback right away in the restaurant or at home.